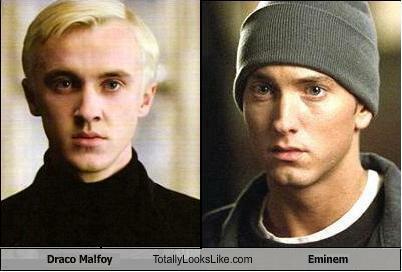 Draco Malfoy totally looks like.... . Wallpaper and background images in the 해리 포터 대 트와일라잇 club tagged: movie harry potter draco malfoy eminem totally looks like. White Boys With Bad Attitudes Club, an angry rapper and an angry wizard!!! there eyes look the same and there lips!!! !